While campaigning in Dalton, Georgia, Stacey Abrams was confronted with a question concerning the Second Amendment. 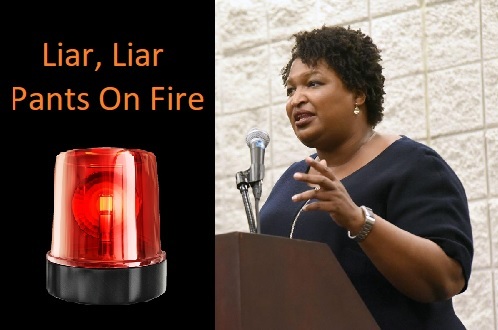 Instead of owning up to her past support for (HB 731 -2016) and (HB 10 – 2017), which would BAN, CONFISCATE, and DESTROY virtually all “semiautos”, magazines over 10 rounds, and tens of millions of rounds of ammunition, Abrams said that she’s “not taking anyone’s guns”. “I was wondering what you would have me tell my friends who say that you’re going to come take their guns away,” one young woman asked Abrams. We know this is a flat-out lie because of the legislation she cosponsored in the past that would order the GBI to seize, confiscate, and destroy firearms, ammunition, and magazines. You can read the entire Abrams anti-gun record below compiled from years of grassroots alerts from Georgia Gun Owners. Please send this article to as many folks as you can send it to so they won’t be hood winked by Abrams’ lies.